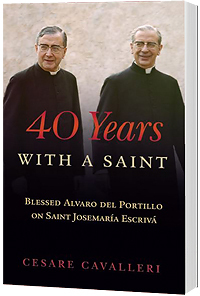 First published in English in 1996 as Immersed in God, 40 Years With a Saint is a special 20th anniversary edition of the interview with Blessed Alvaro del Portillo (1914-1994) about his years living and working with Saint Josemaria Escriva (1902-1975), the founder of Opus Dei. Blessed Alvaro del Portillo was St. Josemaria Escriva’s closest collaborator for almost 40 years, he was his confessor, and became his successor as the Prelate of Opus Dei from 1976 until his death. In this interview by Italian journalist Cesare Cavalleri, Blessed Alvaro del Portillo brought to light dozens of details of the life of St. Josemaria, some of which had never before been published. Recounted, in particular, are many incidents of St. Josemaria’s life in Spain and in Rome, the obstacles he encountered in establishing Opus Dei around the world, his intense life of prayer and apostolate, and his friendships with persons from all walks of life. This is not a biography but rather an intimate and personal portrait built up from countless small but vivid details that only an eyewitness could supply.